135/365(+1), a photo by Luca Rossini on Flickr. I’m all alone in my new big house. I left Claudia and Agata in The Netherlands. I’ll return to them in a few days. But for now I’m in Rome, all alone. The house is unnaturally quiet and still. It’s like time has suddenly stopped. I take my time to look at the place. I slowly walk between all the rooms, I carefully switch on and off all the lights. It’s beautiful. Take my new library, for example. Isn’t it gorgeous? 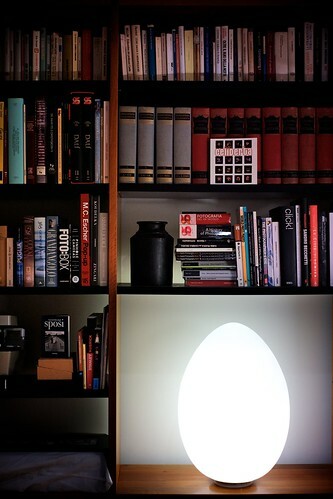 The egg lamp seems to have been designed with for being placed in it. Finally I have some proper bookshelves where to arrange my favorite books. I’m all alone in this quiet and creepily still house. It’s time to watch a horror masterpiece. I already chose it. It will be the Exorcist.